When we’re using iPhone/iPad/iPod/iTUnes to organize our music files, we’ll come up with the problems of lacking information of the music albums. Of course, if the users purchase songs in iTunes Store, they will probably get the complete album information of the songs, including album artwork, artist name, genre, etc. If the users rip songs from CDs or get songs from other ways, they may lack the album info especially album artwork, which might be the most annoying part for people to add manually. The following post will introduce several helpful methods for people to add album artwork to iPhone/iPad/iPod. These methods work with all iPhone/iPad/iPod modes, including iPhone 6s/6s Plus. In order to add album artwork to iTunes for iPhone/iPad/iPod, you could do as follows. Open iTunes Preferences(Mac: Choose iTunes > Preferences.Windows: Choose Edit > Preferences. )Then click “Store” button, and you could select the “Automatically download album artwork” check-box. You could also directly right-click target song and then select “Get Album Artwork” option (in iTunes 11 and later versions). "Get iPhone 5 Missing Some Album Artwork – I got my new iPhone 5 yesterday – manually manage my music, so I was adding albums last night, noticed today that some of the artwork is not showing up on the phone. I buy all my music through iTunes, and it had all been there on my iPhone 4. Weird thing is that only SOME of the songs/albums dont have the artwork….others do. Is there any setting I need to adjust, or anything I can do to ensure the artwork comes across when I drag & drop?" To add album artwork to iPhone/iPad/iPod songs, the best way is to use Leawo Tunes Cleaner, a professional iTunes album artwork finder app to get album artwork for iPod, iTunes, iPhone, iPad and MP3 players. 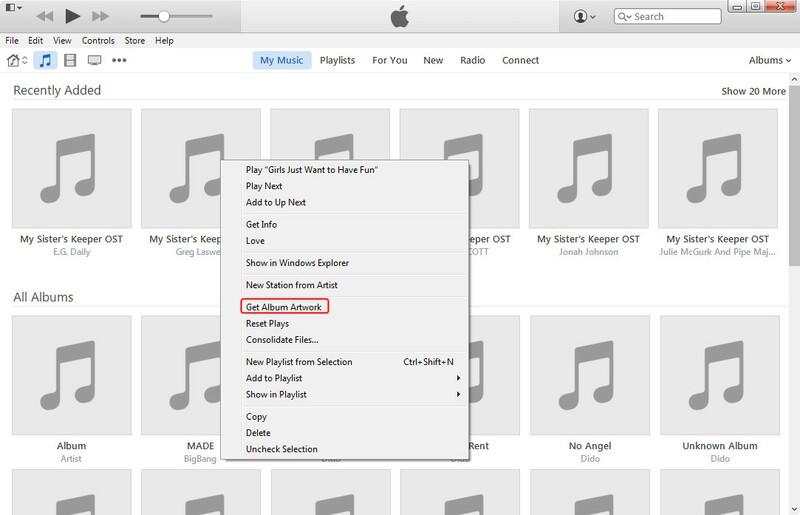 Follow the below guide to know the detailed steps to add album artwork to iPhone/iPad/iPod songs through iTunes. Click the "Start to Clean iTunes" option on this Tunes Cleaner program interface to let this iTunes album artwork finder automatically scan your iTunes music library. >With scanning results displayed in different categories, you could see which songs’ album artworks are missing under "Songs Without Album Artwork" category. The "Songs Without Artist" and "Songs Without Album" categories show you songs without artist or album. Click the "Fix All" button. 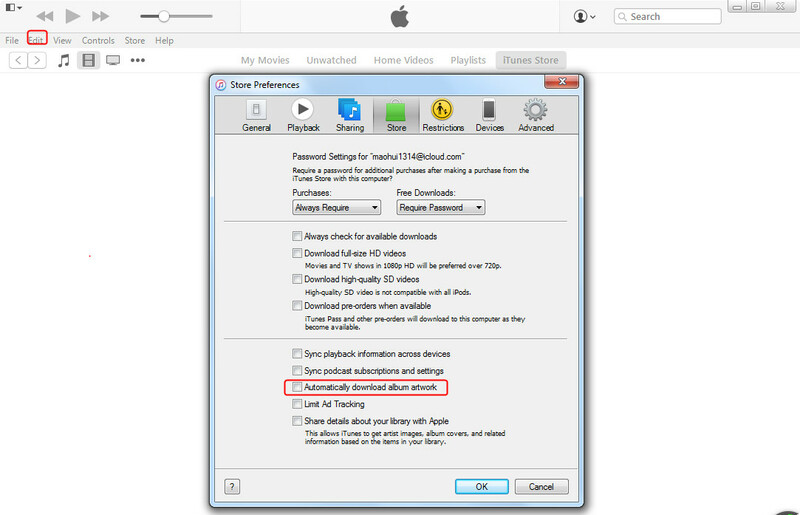 After automatical fixing, this program would lead you to apply fixed results to iTunes. But if there exist Unrecognizable Songs option, you could choose to do manual fixing or not. Check a music file, and then click "Edit" icon to call out the editor for manual fixing. Save the manual fixing and then close the editor. Click the yellow "Apply" button to apply the fixed results to iTunes music library. All your iTunes music files are added with album artwork. To sync these iTunes music files to iPhone/iPad/iPod, you need to connect your iPhone/iPad/iPod to computer and sync the songs as Apple has told you. Note: Leawo Tunes Cleaner is not only applicable to adding album artwork for iTunes music files, it could also find and add album artwork to external music folders like MP4 music folders. Leawo Tunes Cleaner, a professional iTunes album artwork finder program that could download and add album artwork for iPod, iTunes, iPhone, iPad and other MP3 players. Acting as professional iTunes cleaner program, this album artwork finder could not only automatically download and album artwork to songs for iPod/iPhone/iPad/iTunes, but also allows manual editing of song album artwork. What’s more, it still could complete other song info like artist, album, etc. for songs.